The greater the risk, the greater the potential reward is a common adage in investment. After all, if you could generate the best returns by investing in UK government bonds (also known as gilts), why would you ever think of putting any money into racier assets? But measuring risk is difficult, and determining whether the rewards are commensurate with the level of risk you have taken is largely a matter of opinion. Experts measure risk in a number of complicated ways. One of them is through something known as standard deviation. In investment, this figure is a way of expressing how far a fund sways from its average return. In essence, it shows how volatile the performance of a fund has been. The greater the standard deviation, the greater the swings up and down in a fund’s returns. It’s a crude measure and by no means a perfect science, but it is one way of ascertaining how risky a fund may be. Tom Becket, chief investment officer at Psigma Investment Management, says: ‘Investors should be compensated for taking higher risk in the form of greater returns, but whether this materialises depends on your time horizon for investing, your patience and capacity for risk. The correlation between a fund’s standard deviation and its performance is patchy at best. 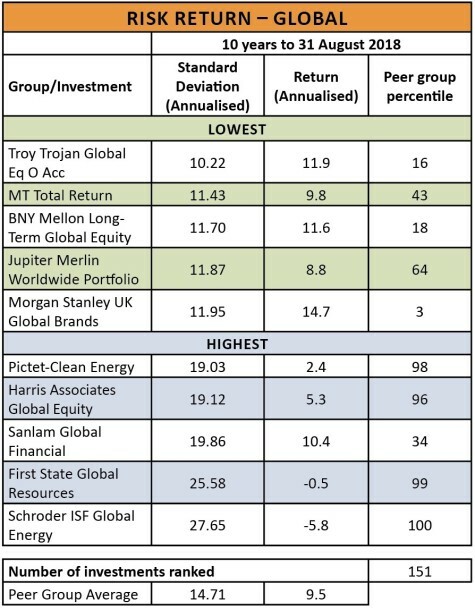 Analysis from stockbroker AJ Bell shows the performance of funds with a track record of at least 10 years, detailing their standard deviation and annualised return over that period, as well as the percentile ranking of the fund within its peer group. 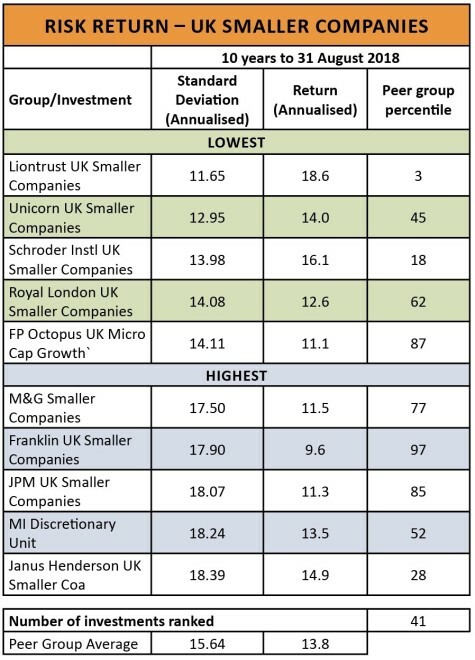 With thousands of funds available to UK investors, the tables in this article show only a snapshot of the data, illustrating the five funds with the highest and the lowest standard deviation within the UK All Companies, UK Smaller Companies and Global investment sectors. 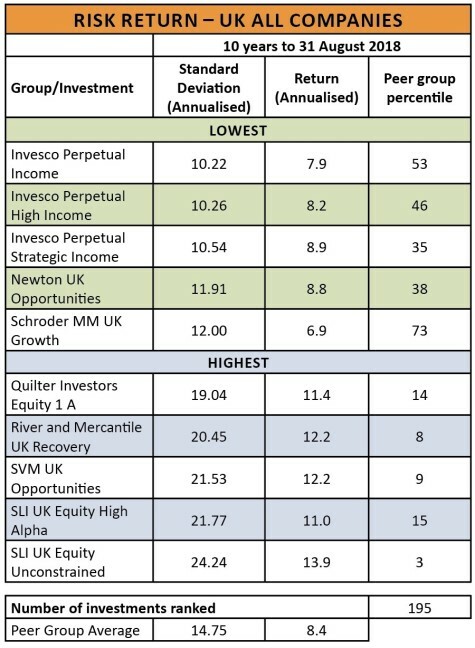 In the UK All Companies sector, greater risk certainly seems to produce greater rewards: the Standard Life UK Equity Unconstrained (B7LK223) fund has a standard deviation of 24.24 – significantly higher than the peer group average of 14.75 – and it has also produced an annualised return of 13.9% over the past decade, putting it in the third percentile of performers. Meanwhile, the Invesco Perpetual Income (BJ04HX6) fund, which has the lowest standard deviation in the sector, has produced an annual return of 7.9% over the same period. But, it’s the Liontrust UK Smaller Companies (B57TMD1) fund which is the standout performer in the UK Smaller Companies sector. 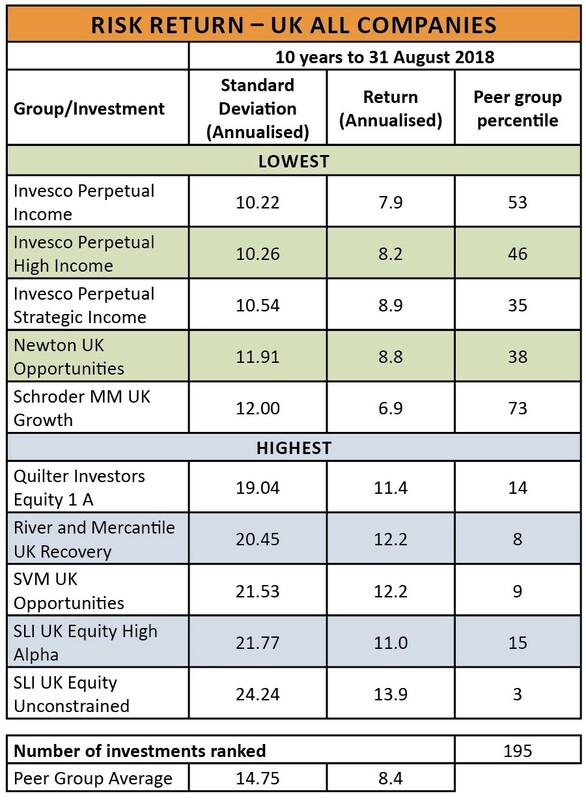 The fund has the lowest standard deviation of its peer group at 11.65 – compared to an average of 15.64 – and has produced a stonking annualised return of 18.6% over the past 10 years, putting it in the third percentile. Meanwhile the average UK smaller companies fund has an annualised return of 13.8% over the same period and Janus Henderson UK Smaller Companies (0744762), the fund with the highest standard deviation, achieved 14.8%. 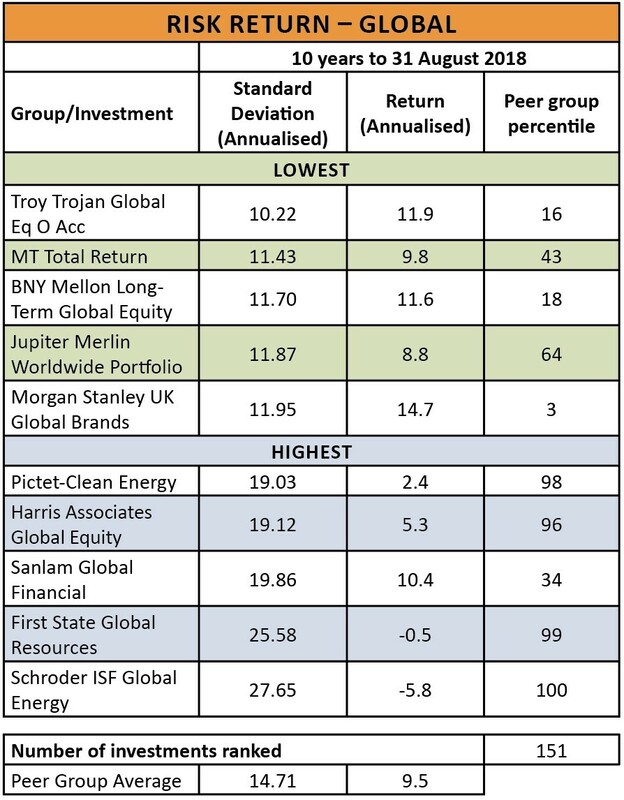 In the Global sector, meanwhile, the two funds with the highest standard deviation have produced negative annualised returns over the past decade. He points to Ladbrokes Coral as one recent example where the stock fell out of favour amid concerns about a government crackdown on the betting industry. In the end, the share price shot up as the company was bought by GVC (GVC). To limit risk the team looks for companies with strong barriers to competition as well as those where the directors have a large stake in the business. The fund veers towards quality companies, which are ‘robust, dependable and better able to weather external economic shocks’.